The first is the U.S. dollar, and the second is sentiment. The U.S. Dollar Index (DXY) spent most of the week powering higher, eventually reaching as high as 95.5, a level not seen in over eight months. Of course, hawkish comments from U.S. Federal Reserve Chair Jerome Powell helped power a rally in the DXY, which gained almost 200 basis points from before the Fed's rate hike. Powell suggested on Wednesday (June 20) that the jobs picture in the United States wasn't particularly tight. 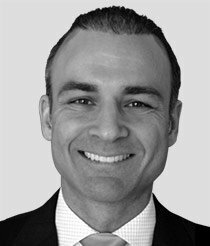 So the market took that to mean the Fed could stay the course on gradual rate hikes in order keep a short leash on both inflation and the risk of economic overheating. Finding bullish support for silver in mainstream media is futile, and that tells me that the weak hands have likely sold. Of course silver will only rally when it's good and ready, but the dollar's recent rally may have already reversed. And that could help the gray metal put in a near-term bottom. Silver's price action over the past week was only exacerbated by the latest bout of strength in the dollar. 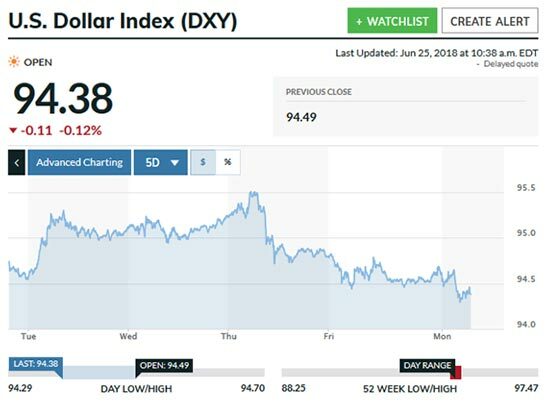 U.S. President Donald Trump's trade wars salvo helped push the DXY to 95.5 on Thursday (June 21). But that was an intraday high. Since then, the index has lost a full 100 basis points as the market comes to realize any possible benefits from tariffs are outweighed by rising input costs. Silver began last Tuesday (June 19) down at $16.24, then bounced between $16.31 and $16.10, its lowest point early on Thursday. Around 6 a.m., the DXY peaked at 95.5, then sold off to end the day at 94.9. That helped silver put in a near-term bottom at $16.17 before powering higher to close at $16.28. On Friday (June 22), the dollar lost more strength to close near 94.5, helping to support silver prices even more. The precious metal gained on the day to close at $16.42. 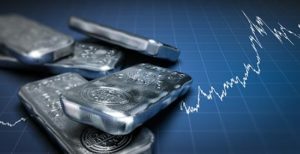 Monday's (June 25) open brought silver a bit lower at $16.36, and by late morning it was trading down at $16.27 as markets took a risk-off approach thanks to renewed trade war worries. But bottoming silver prices mean weak money has left the market. And once we get a new silver rally, the gray metal can really start to run higher.